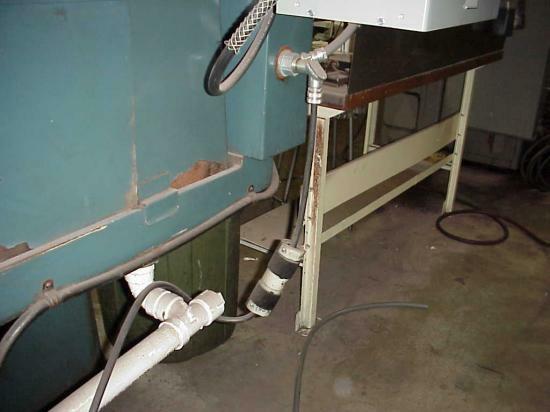 I have a question pertaining to the use of flexible cords in a manufacturing environment. 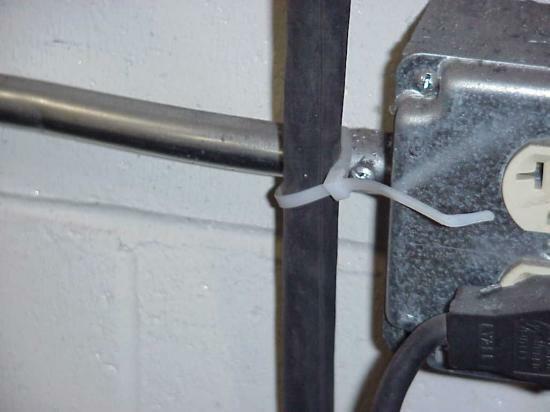 My area of expertise is safety and health for general industry and during inspections and audits at our facilities throughout the US, I find the use of flexible cords as an area of great concern. 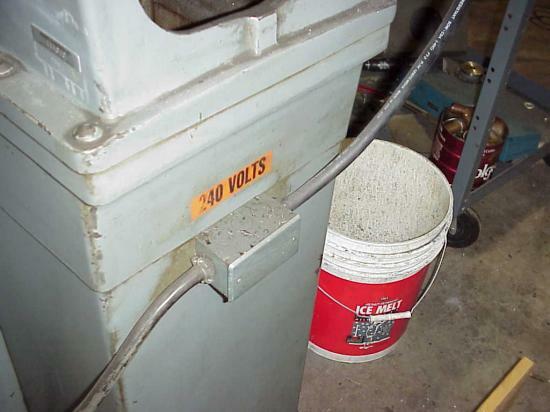 During a recent visit to one of our manufacturing sites I spotted what I feel are clear cut violations of OSHA regulations and the NEC, however the electrical contractor that installed the wiring insists that his work meets code. 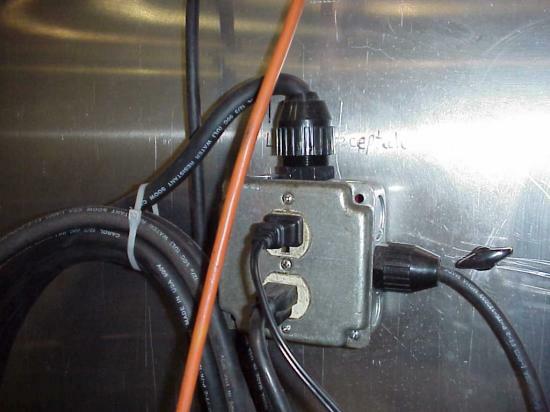 This flexible wiring is primarily used to power outlet boxes and permanently installed equipment. Was a permit pulled for his work? Who's code? Not the NEC for sure. 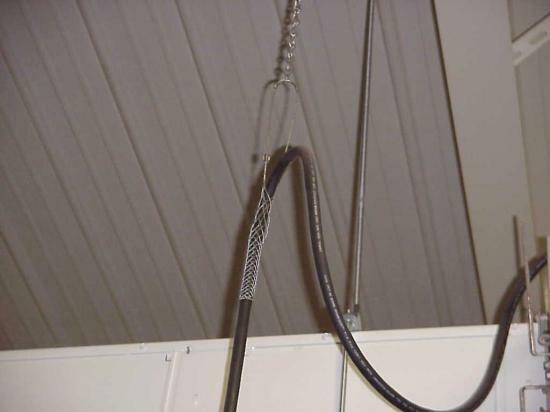 Hanging what looks like poly-phase cords from a roof, without adequate support sets up a bit of a dangerous precedent. What annoys me more, when this standard of work is installed by an EC, some workers on site, get the idea that this is how things are done. This guy's work just screams "I don't give a ****!". 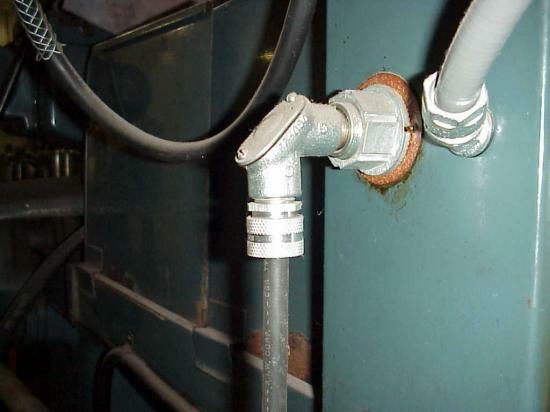 Or "I'm not smart enough to use real wire and conduit". 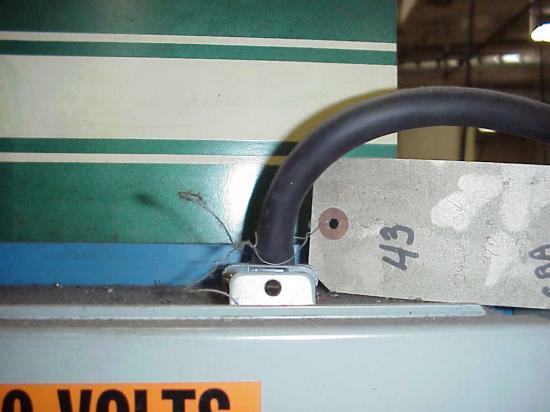 In these pics we see fittigs that are intended for armored or metal-clad cable used with flex cord. Unfortunately, I was taught to do this. I now use prpoer fittings for cords. The 4sq. handy box hanging in mid-air is listed to be mounted permanently. Some strain reliefs and cord grips, but, some of the wiring methods and uses of cords look real low-budget. S.O., S.O., Its off to work we go! I hate to say this, but the intall might actually be legit, if messy looking. 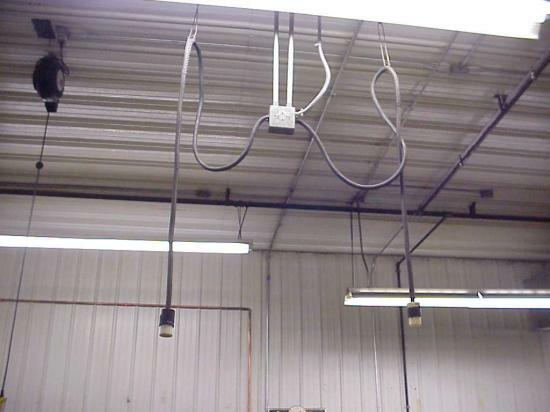 Drop cords....those plugs coming down from the ceiling...are a common way to power machinery. It works very well, and often places the cord in a place where it's out of the way (how often have you tripped over a pipe or raceway set on the floor?). The two-screw connectors are actually listed for connecting flexible cords...look at the note on the box they come in. 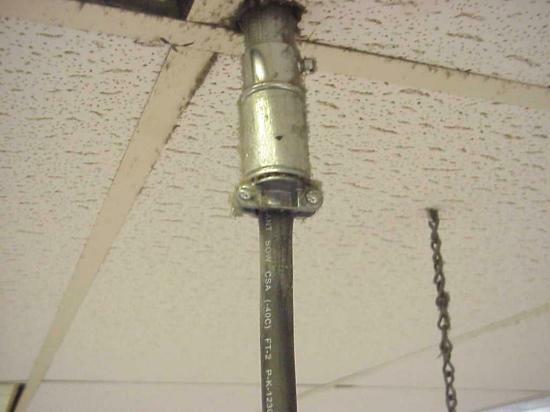 The prohibition of flexible cord above a dropped ceiling dates from 2002...so that would be OK if older than that. Many of the cords look as if they came with the machines- in which case using them is proper. 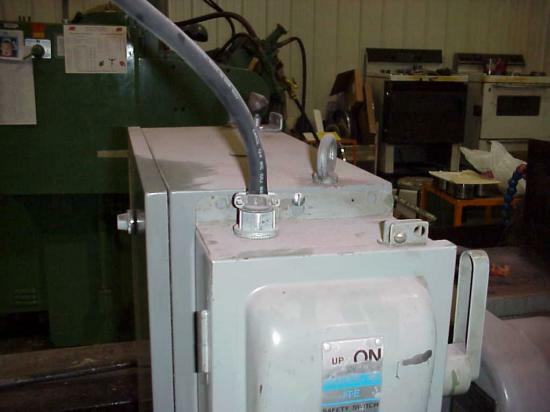 Several of the parts used are not cheap, and show some attention to detail. 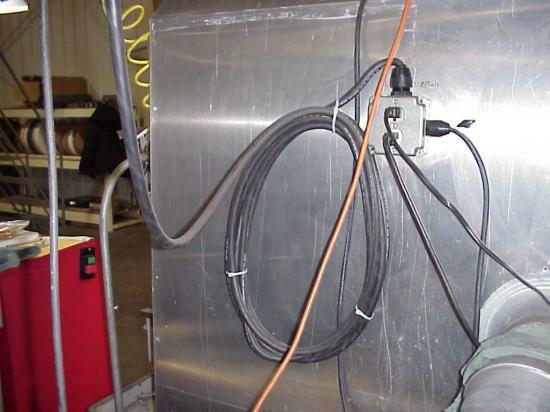 One area of possible concern....flexible cords can not be uses as a substitute for permanent wiring (400.8(1)). The long run across a ceiling may be such an area of violation. 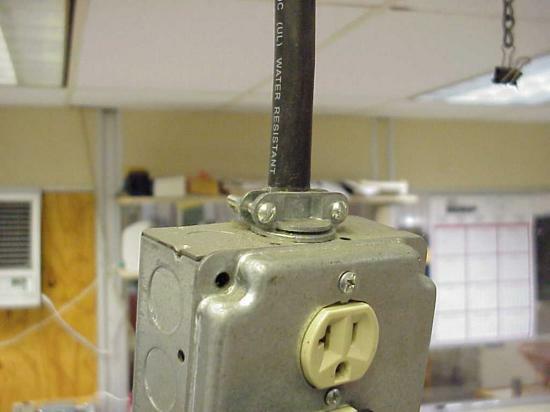 (Drop cords typically drop straight down, not run horizontally). I can't find it right now (someone help me here! 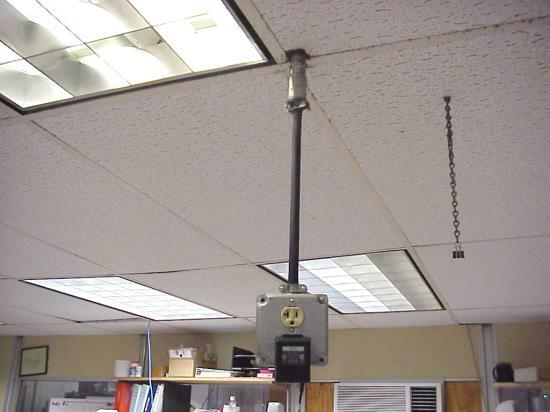 ), but I know that the NEC also requires pendant boxes to have the cord enter through a threaded hub...so the use of the 4-square boxes is a violation. (1) Flexible Cord. 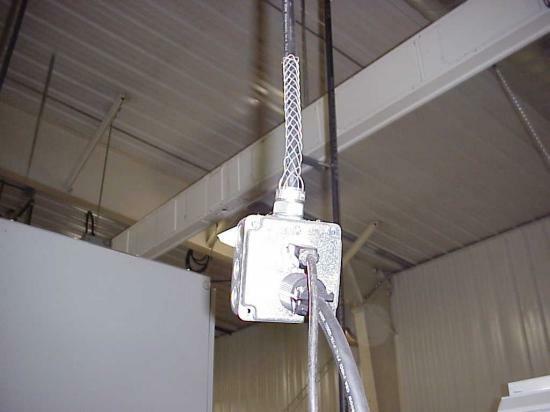 A box shall be supported from a multiconductor cord or cable in an approved manner that protects the conductors against strain, such as a strain-relief connector threaded into a box with a hub.